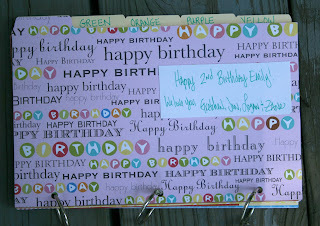 My cousin, Angie, who lives in Georgia was in town visiting the family and her daughter, sweet, little Emily's 2nd birthday was celebrated. As you know I am making all of my gifts this year and since this was planned at the last minute I needed a last minute gift to make. I made a very easy mini book for her. Using small file folders and binder rings (found at an office supply store) I created a book to learn colors and numbers. 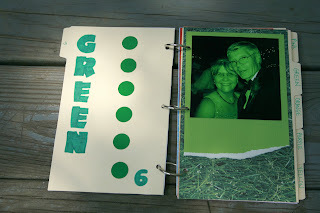 Each page I photoshoped the picture to be an entire color over the image and then used scraps of card stock to decorate. 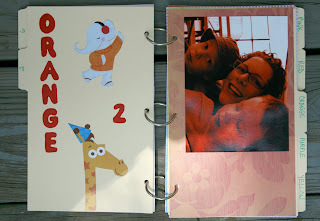 The giraffe on the orange page is actually from a Toys R Us advertisement I got in the mail. Each page has a picture of a family member so not only will she learn colors, numbers and shapes she'll also learn the faces of her family in Maryland.